CiF president Jaume Ferrer, tourism councillor Alejandra Ferrer and chief of tourism promotions Carlos Bernús attended the opening event today of Madrid's International Tourism Trade Fair, or FITUR, which runs Wednesday to Sunday (January 23-27). In a dedicated section within the Balearic Islands' stand at the fair, Formentera will share promotional material related to gastronomy, local heritage and natural spaces, making special mention of “all Formentera has to offer after the rush of the high season”. Councillor Ferrer will meet with representatives of niche media outlets tomorrow to present some of the pioneering features of Formentera's 2019 effort to attract visitors. 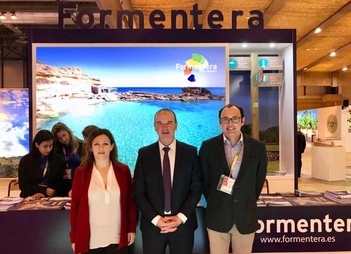 Among them is a brand-new tourism website and Formentera 365, an app Ferrer said is aimed at “promoting the local businesses that open more winter months”. Formentera will also talk to the journalists about a new book on homespun gastronomy called “Sabors de Formentera. Receptes tradicionals d'una illa singular” and trailblazing plans for guided tours on local heritage sites and birdwatching in 2019. As ever, Formentera's representatives at the fair will talk about nature trails and unveil the 2019 calendar of cultural and sporting events, not to mention dedicate air time to the “Discover Formentera” campaigns of May and October. Another presentation on Friday January 25 will focus exclusively on activities for fans of fitness. “It will all be tied in”, explained Ferrer, “to Formentera's eternal message for tourists about the importance of striking a balance between tourism and local environmental sustainability”.